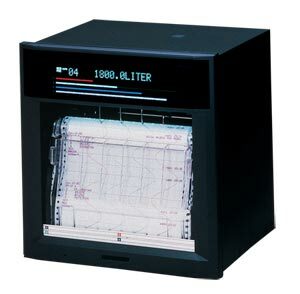 The RD100B 100 mm (4") and RD1800B 180 mm (7") Series programmable chart recorders are easy to use. They feature universal thermocouple, RTD, and DC voltage (mV or V) inputs, as well as an analog bar graph and a digital display. Each recorder can print out—at programmed intervals or on demand—the date and time, channel number, scale marking, tag number, proper engineering units, chart speed, alarm value, and complete program list. The non-contact, ultrasonic pen-position transducer is more accurate than standard pen mechanisms. The wear-free, brushless DC servo-motor eliminates the need for motor brushes, lead wire, and connectors, and is directly mounted to the printed circuit board. These 2 features contribute to the long, trouble-free life of these recorders. Optional Communication Output The optional RS422A/485 or Ethernet interface lets the user connect up to 32 units on a multidrop line to a single host computer for data logging or input/output of any setup parameter. The user can select up to 4 of the following 6 alarm types: high/low limit, deviation high/low limit, rate of change high/low. Optional alarm relay contact outputs are front-panel selectable. Also included is a remote control feature, which lets the user select any 5 of the following functions through the front keypad: recording start/stop; chart speed change; manual printout start; message printout start (up to 5 user-defined messages). Nota: Each unit comes with 1 pen per channel, 1 pack of paper, mounting brackets and complete operator’s manual. OMEGACARESM extended warranty program is available for models shown on this page. OMEGACARESM covers parts, labor and equivalent loaners. Ask your sales representative for full details when placing an order.